Use feng shui cycles to do more with less effort by using nature to help succeed in life. Learn what the feng shui cycles are and how to use them to make life easier. Feng shui uses these cycles to create the ideal home for success.. The day, lunar and seasonal cycles have similar properties and were described by yin and yang plus the five elements in China. So the day, full moon and summer are brighter and encourage greater activity, whereas the night, new moon and winter are darker and encourage rest. At the same time the south side of a home with have more brighter, yang qualities and encourage activity, whilst the north is more shady, creating a better atmosphere for rest. In essence our experience of time is being applied to space. 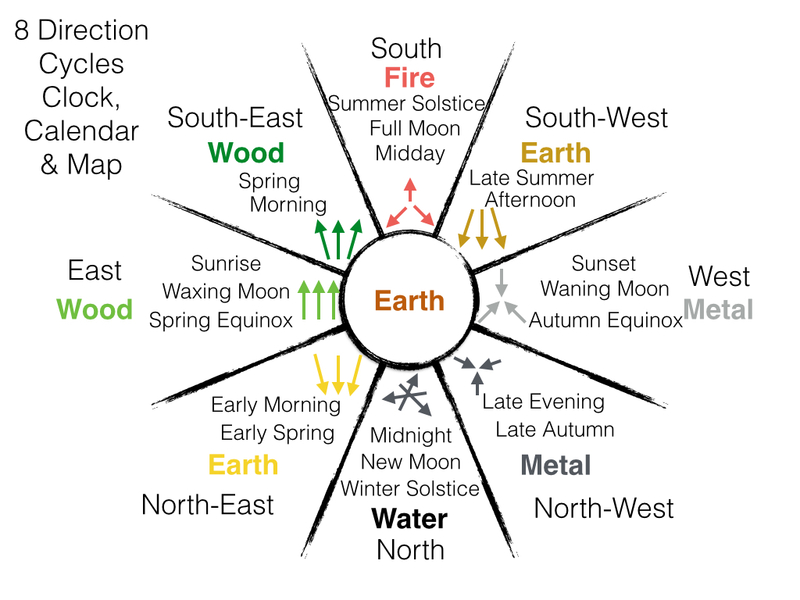 The chart above shows the connection between the 8 directions and the day, lunar and year cycles, along with corresponding directions. In addition it shows the five elements and directions of energy associated with each direction. When we know which phase we want to strengthen we can apply feng shui to strengthen that change, as described at the end of this article. The feng shui cycles chart above uses the life cycle of a plant to describe the different phases of the feng shui cycles. This is a universal cycle that can be applied to anything in life. The aim is to help understand the different phases of nature, for example through a plant. We can then apply the cycle to any real life issues. The cycle begins and ends in the north, which corresponds to the night, new moon and winter. The chart above describes the feng shui cycles in terms of a human life cycle. 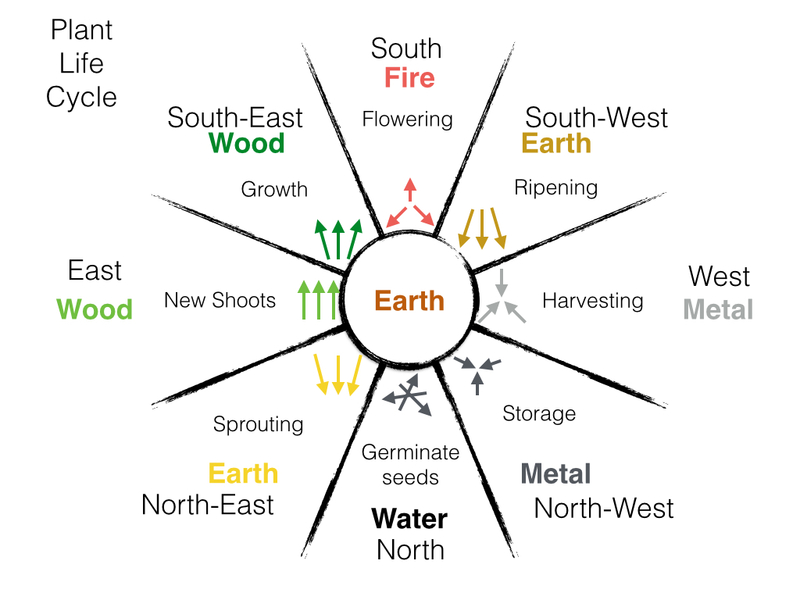 Birth begins in the north and follows the cycle clockwise until leaving our body, back in the north phase. 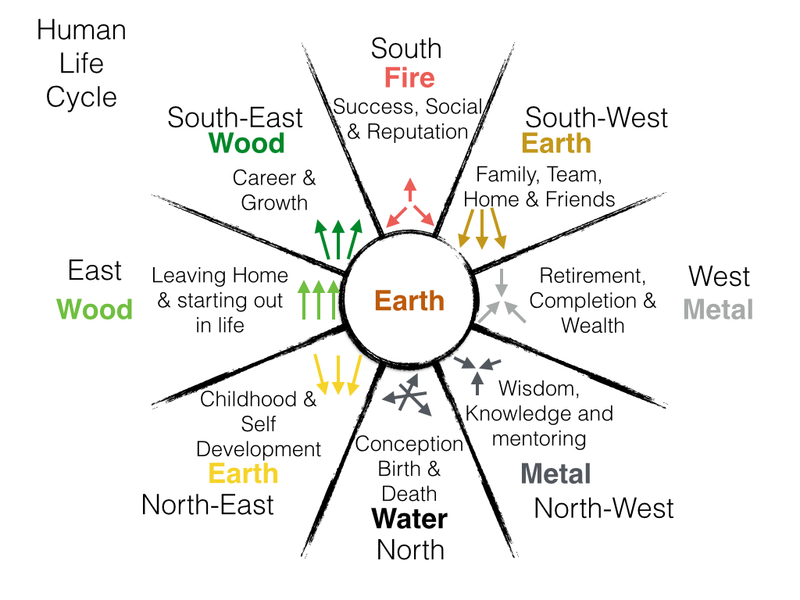 This analogy helps understand the character of each part of the feng shui cycles. It also provides an indication of where we are in our own cycle. Are we still in an early phase of the cycle or have we jumped ahead? Where would we like to be right now and which part of the cycle would be most helpful for success? Once we know which kind of chi we want more of, we can use feng shui to find practical solutions. The above chart applies the feng shui cycles to a business cycle. The idea starts in the north and moves through the various phases until reaching the north-west. Where is your business in its evolution? Which phase have you reached? Where do you need to be for greater success? Which phases will help you overcome current challenges? Have we done all the hard work getting started / east and developing a market / south-east, but not reached the west where we make profits? Do we need to focus on branding / south and customer services / south-west to get to the profits / west? Sometimes we have to go back to move forward. Do we need to go back and find new ways to grow our business? Wherever we want to develop our business we use the directions to increase success through a mixture of feng shui and practical changes. 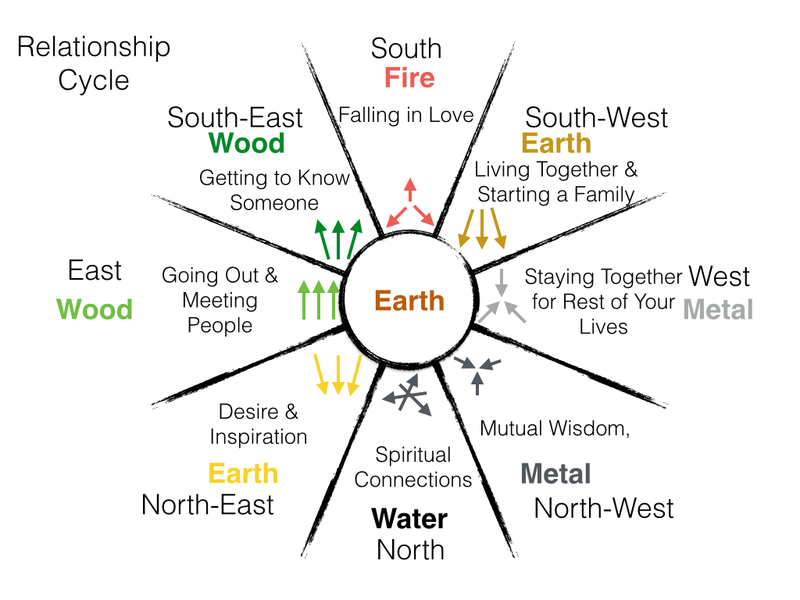 Applying feng shui cycles to relationships, we start in the north-east. This is during childhood where we observe our parents, and develop our fantasies about relationships through stories, and our imagination. Sometimes this becomes the foundation for all our relationships that follow. The east relates to going out and meeting people, or nowadays internet dating. The southeast, taking time to really know someone and being patient. This is where we might be too quick to dismiss a potential lover. The south is where we fall in love. The southwest phase represents motherhood, so is associated with starting a family and creating a home together. The west is where we let go of doubts, temptations and keeping options open, so we can totally commit to a relationship. The northwest takes us to a common wisdom. Finally the north phase is where we might find a deep spiritual connection. Interesting to note that this describes a journey that lasts until the end of our lives. There is no need to have it all near the beginning. We can enjoy each stage and accept that sometimes it takes a while for a relationship to evolve. Where are you in your relationship? If you are looking for a relationship have you fully committed to the first 3 stages? Whenever we want to enhance a relationship, we use feng shui to develop the chi of that direction. 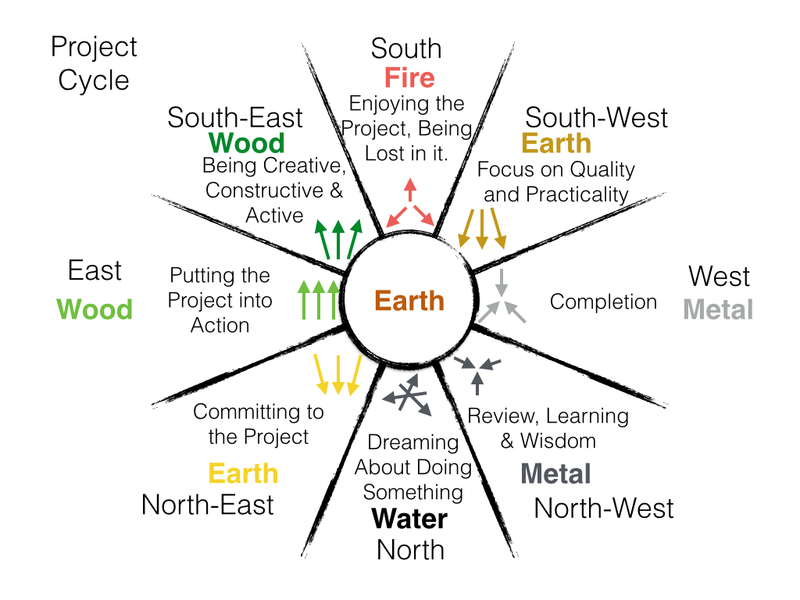 We can apply the feng shui cycles to any project. This project cycles work for blogs, websites, writing, art, design, craft, starting new career… Again it all starts in the north. This is where the daydreaming and big vision is created. North-east is the energy for committing to our project and making it happen. East is where we take action and make the project happen. South-east is the phase for doing the project, growing it and creating. South is the stage is where we have passion for what we do and make it a success. The south-west is the direction for perfecting our project. West represents the chi for completion and feeling satisfied with our project. 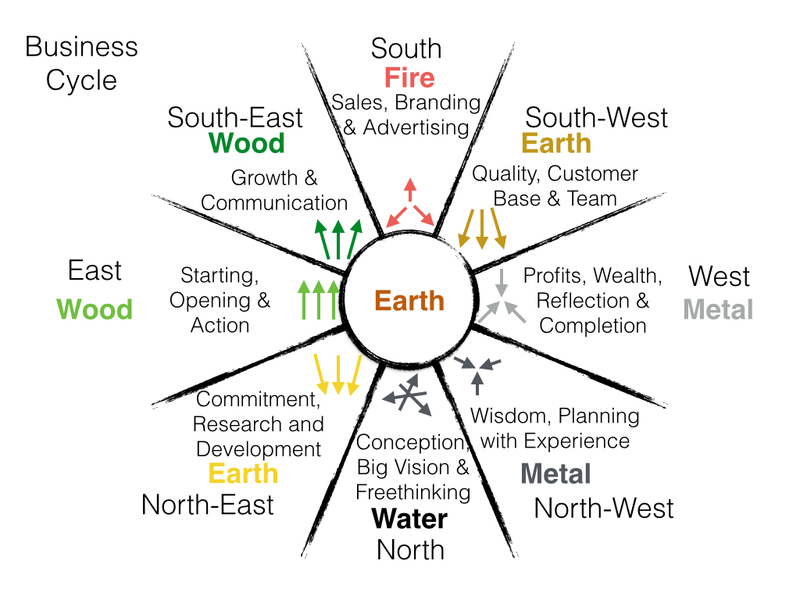 The north-west is the phase for learning from our experience and being able to repeat the cycle with greater wisdom. You can benefit from feng shui and feng shui astrology with Simon Brown, using the feng shui cycles. Call 07543663227 or email Simon to discuss how to apply feng shui to your projects, relationships, businesses or careers.